Hope to see as many decent drivers there as possible, don't bother entering if you've not even heard of this server or are constantly moaned at for ramming. Don't forget to check out our website at http://project-apollo.co.uk/url for all the latests news, stats and results! Entries for URL season 2 are now closed. 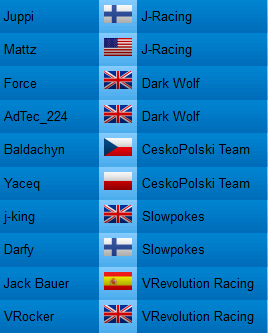 The first race will begin Monday 13th February @ 8PM GMT. Team owners make sure your drivers are aware of this fact please! Just a reminder to everybody that Round 1 of the URL will start in 4hrs 30mins (8PM GMT), team owners will be given server information 30mins before the race start. Crys will replace Baldachyn at CeskoPolski for the rest of the season.